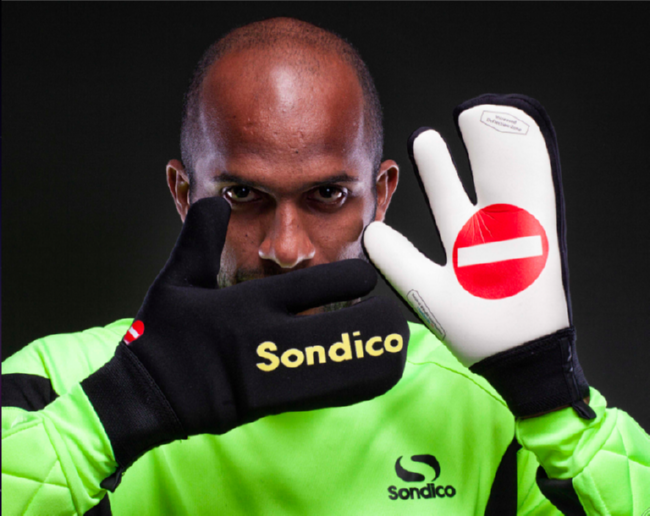 We’re not quite sure if we’re having our puddings pulled here, but the chaps over at Sondico assure us that Wigan ‘keeper Ali Al-Habsi is to debut a new pair of ‘Penalty Saver’ goalie gloves today should the FA Cup Final go to a shoot-out this afternoon. The gloves have a “mitten style webbing” of the third, fourth, and fifth fingers to create a larger surface area which is the kind of thing that comes in handy when repelling penalties. As far as we can work out, Al-Habsi will wear his regular gloves for the game and slip these little beauties on should the final go to penalties. Weird. We’re getting “Danny DeVito as Penguin” vibes, though the “non shall pass” decal is definitely a nice touch! Reckon he’ll blame these should they lose in the penalties? But there is one problem – he’s not in first eleven. Well now doesn’t this look silly! Nah, this still looks cool. “non shall pass”? “non”? The people who write for this site truly are retarded. @Meg: How fantastic your life must be.